Brother offers free mobile apps for printing, labelling and support functions. Download from the App Store or Google Play Store and simplify how you use your Brother products. 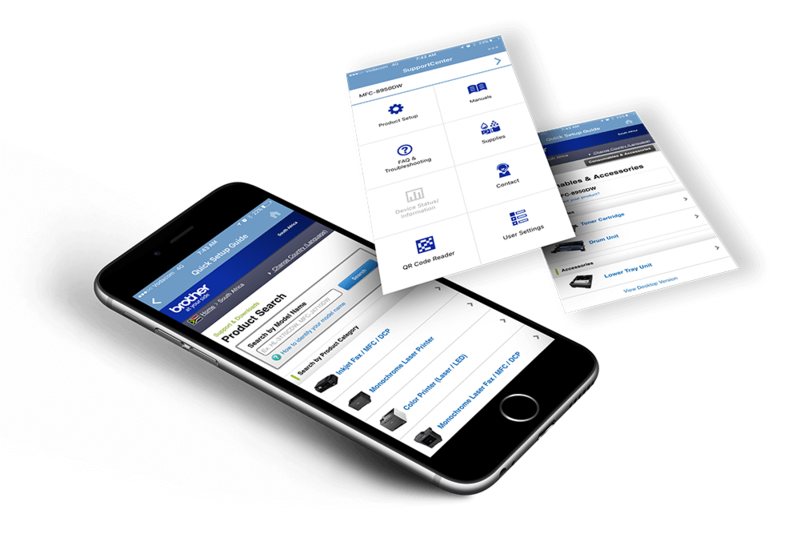 Brother iPrint&Scan is a free app that enables you to print from or scan to your Apple or Android device by using your wireless network. Convenient and easy to use, the app will automatically search for supported Brother devices on your wireless network. Print photos (JPEG images) directly from your photo album to your compatible Brother device (A4, letter, legal, A3, ledger). Simply tap the Brother iPrint&Scan application, scroll through your photo album and select the photo you want to print. Tap the ‘Print’ button and the photo will be sent wirelessly to your Brother printer. Scan documents from your Brother Multi-function Centre and store or share your documents and photos via e-mail and more. Share your old printed photos with family and friends by simply scanning it from your Brother Multi-function Centre to your smartphone or tablet. Save your photo in the album or email as an attachment in JPEG or PDF format. All wireless Printers and Multi-function Centres are compatible but settings will depend on the selected device and function. Create, share and edit documents on your Brother device. Our suite of cloud-based apps allows you to get creative with your documents, without the need for a computer. These apps can be accessed directly through your compatible Brother device. Our expanding range of apps aims to give you the power to create great documents direct from your machine. These apps can be downloaded straight to your mobile device whether that be your smartphone or tablet. The Brother Scan To Office App scans a hard copy document and uses OCR (Optical Character Recognition) to convert it into a Word®, Excel®, or PowerPoint®file with editable text. This app also saves the images in the document as individual JPEGs that can be moved within or deleted from the new document. The Brother Easy Scan To E-mail App takes a document you’ve just scanned, and sends it to an e-mail address selected from a pre-populated address book. Create a custom address book with up to 10 addresses, and then select a recipient with the push of a button. 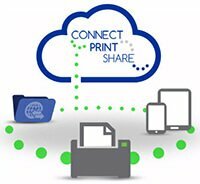 Brother Web Connect allows users to upload files straight from a scanner or memory card to social media platforms and cloud storage sites. The innovative software also allows users to print directly from online storage sites. Connect directly to your social media accounts such as Facebook and Flickr, to share your photos and documents. Use Brother’s Web Connect to upload to popular sites. Brother™ iPrint&Label is a free app for printing labels from your compatible Apple or Android device to a compatible Brother device using your wireless network. Convenient and easy to use, the app will automatically search for supported Brother devices on your wireless network. P-touch Design&Print is a free app that enables you to design and print labels from your smartphone or tablet to the Brother P-touch PT-P300BT label printer using Bluetooth wireless technology. Mobile Cable Label Tool is a free application designed to create labels for telecom, datacom and/or electrical identifications on demand. It enables you to easily print labels from your Android™ smartphone/tablet to a Brother label printer using a local wireless network. Mobile Transfer Express is an application that allows you to use a mobile device to transfer compatible label templates, databases and images with P-touch Transfer Manager (Windows version) onto a label printer.